Latin and Central America has found itself infested with a series of hybrid, imperfectly democratic, and authoritarian governments, following a slew of revolutions, civil wars, and mass deaths. Next to no country seems capable of avoiding mass protests from civilians, who often call for their democratic freedom and liberation from despotic leaders. Nicaragua is the latest country to fall into mass civil unrest and a climbing death toll as the country enters its third month of protests against Pres. Daniel Ortega. Ortega first came to power in Nicaragua in 1979, following the Sandinista revolution during the Anastasio Somoza dictatorship in the 60s and 70s. His family was heavily involved in the Sandinista National Liberation Front (Frente Sandinista de Liberación Nacional, or FSLN), fighting against the US-backed dictatorship during the peak of the Cold War and coordinated the Junta of National Reconstruction. After taking power, the FSLN government sought out drastic changes for their country, involving education and health revisions as well as the redistribution of land. His initial rule over the people of Nicaragua was not blood-free as post-revolution US-backed Contra groups waged war on the new government. This war reached its conclusion at the end of the 80s and followed with the dissolution of Ortega’s FSLN government after their defeat in the 1990 election by an anti-Sandinista leading party, the National Opposition Union. This did not mean the end of Ortega though, as he used the years between him leaving office in the 90s and coming back to power in 2007 to wage a secret war against his political opponents as if he were “ruling from below”. He strove to win as much power as possible in the background up until the 2006 presidential elections, in which Ortega was voted into office. One of the main steps he took after being voted in was to change the legislation to allow himself to run for re-election indefinitely, ending all term limits. He also moved towards making his wife his Vice President, while at the same time taking control of all ruling aspects of Nicaragua, such as the courts, army, media, and electoral authorities. Despite preaching against capitalism and imperialism, a key to his long-standing position in power can be attributed to his close cooperation with many big businesses of Nicaragua, which repeatedly seemed to back his policies. In 2013, demands from low-earning pensioners regarding reduced pensions initiated the first wave of protests. More protests arose in the following year, as Ortega began the construction of an inter-oceanic Nicaragua Canal which would flow from the Pacific to the Atlantic Ocean. Many farmers who owned land across this area feared eviction, and they were joined by people concerned about environmental issues and indigenous rights trampled by the canal. The opposition leader, Nuñez called the project unconstitutional. The courts, however, chose to not challenge the building of the canal, leading to many more joining the protests in the streets. The latest unrests began in Nicaragua on the 18th of April this year, soon after President Ortega attempted to change the country’s Social Security Institute, effectively aiming at reducing pensions and raising taxes for workers and employers in the future. The protests were led mainly by young Nicaraguans and students calling for Ortega and Murillo to step down. As the violence began to escalate dramatically in the streets of the capital, Managua, during the first five days following the reforms, the President withdrew these proposed changes. But the damage was already done— not only did the protests persist, but they grew, with continuing cries for the President’s resignation. In the later years in power, however, Ortega’s policies have pushed Nicaragua to become one of the poorest countries in the world, ranking 123rd in the world as per nominal GDP in 2017 according to the IMF. Preceding his pension and tax alterations, Nicaragua’s social security institute went bankrupt, hence leading to these harsh changes in social welfare. One anonymous student, who we will call “Logam” for security reasons, has found himself fully immersed in the protests in Nicaragua, and in fact has taken part in most protests in Managua and in the National Autonomous University of Nicaragua, the largest university of the country. Here is his personal account of the major events up to today. The protests begin in April, but many people have been working on different fronts against much of the bad things that have happened the last years due to the government of Daniel Ortega. But the physical protests began on the 19th of April, as many students were dissatisfied with the reforms to the Nicaraguan Institute of Social Security. Personally, I understood that the reforms were guided by external influences, such as the IMF. However, these were facilitated by the bad administration of the Government of Ortega/Murillo. This caused some students from UCA (Universidad Centro Americana) to start protesting. As usual, they were beaten by the government mobs. Personally, I was outraged, it kindled my heart so much that the next day I became one of the protesters! I went to the UPOLI Polytechnic University of Nicaragua, where at night the police repressed us and the first student died. For many, and myself included, it was not only the bad administration of the State that had accumulated over the years, it was seeing how the government murdered a fellow student that became a fuel to keep protesting. The government just wanted to turn the page as if our fellow student was an animal, a monster, or a criminal. The day after the death of our companion from UPOLI, thousands of students joined the fight. It was no longer for social security, it was for freedom and for justice so that the fallen of the UPOLI would not go unpunished. But the next days were a lot bloodier. Little by little in the protests the old traditions of struggle inherited by the guerrillas in the 70s revived. The students used mortars and rocks against bullets, the old slogans resurrected: “The united people will never be defeated!”, “free country or die!”. The fighting was cruel, our weapons were the stones and the few mortars that we had. Nevertheless, we fought for many hours. The youthful fury is in the air. I remember that a young man went through a Tree of Life, which is a metal object placed in all Nicaragua by Daniel Ortega’s wife. The boy was unloading all his fury on it, beating it with a stick, I went and I told him, ‘Loco puta, like that you will do nothing, better get a saw and drop it’. Four hours later the structure was on the floor. I did not see it fall, but I heard the rumble of the blow and how that noise was stifled by the euphoria of the people who were there, watching as one of the power symbols of the presidential couple collapsed. That day half an hour after that tree fell, the shots started. That was on Friday the 20th, the 3rd day of the protests. In that area the policemen fired, when this happened, we, the students threw stones and the few mortars that we had. Slowly and little by little, the police had accumulated forces in the new baseball stadium, and they attacked and fired the University faculties at the UNI (Universidad Nacional de Ingenieria). We resisted but we could not face them. Some retreated to the Cathedral, others next to the UNI. The police should not attack churches and students facilities. Those that retreated to the side of the UCA (Universidad Centro Americana) managed to leave, but those that were captured disappeared. As for me, I had to flee to the cathedral. The police fired at the cathedral doors and bombed the roof. The rumblings were suffocated by the screaming of the hundreds of people who were there locked up. We could not do anything. It was the intervention of the Bishop that calmed the situation. However, the security of those who left was not assured. We do not know what happened with them, some disappeared, others went well to their homes and others were murdered. That day the police killed many people. They killed a child of 15 years old who had only come to give water to students. The Ministry of Health gave the order not to attend to the wounded. In those first days the government would also cut the communication channels down when they were transmitting the struggles in the streets. They wanted people to see nothing, but social networks acted as a supplementary element, that is, they made up for the lack of communication. At this point I always remember the phrase of Marx, when he said that history repeats itself, first as a tragedy, then as a comedy. This is a bitter tragedy, to see how the struggle against a dictatorship in the 70’s brought with it the germ of another dictatorship just as bloody. It is up to this generation to give the fight and not allow the blood of young people to be spilled again. They are contributing. We still have many things to do, to understand and assimilate, but the courage and the bravery of these young people should be an example to the world, we hope that their death, suffering, and effort are not in vain and that their nobility hides a new generation that will free Nicaragua of inequality and ignominy. On June 12th, he contacted me again to tell me about a new deadly attack that took place in Managua. Today, they attacked. And it was like a war. At 2 in the morning, in the university campus that was taken, their snipers and paramilitaries attacked us for more than two hours. The bullets buzzed through everyone’s ears, some were immobile, others defended themselves with mortar. After two hours in the middle of the fire, fighting with teeth and nails, no one died or got hurt. All remained calm and managed to get out alive. They shot to kill, but we were all calm and patient. We defended until we could retreat to a safe place. 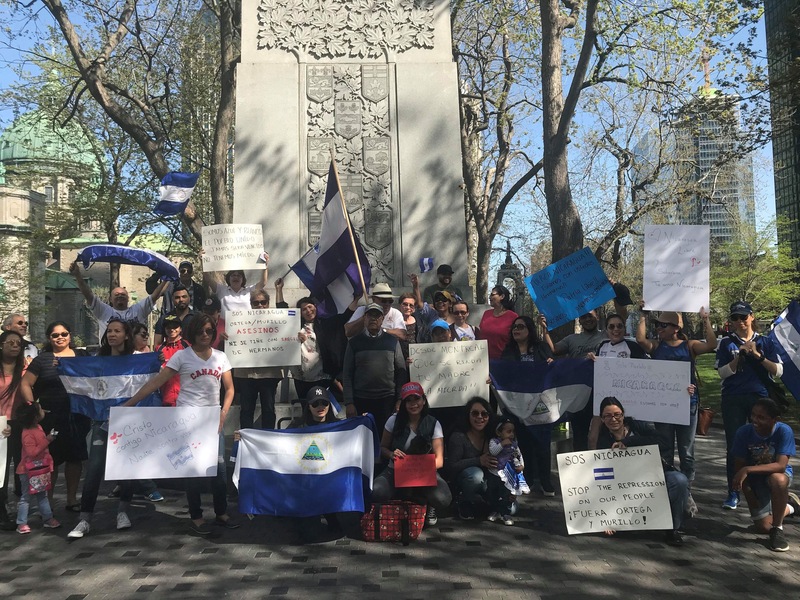 Nicaraguans holding a rally in Montréal. The death toll in the past two months since has risen to 200 people. The protests and uprisings from the streets seem to be working, as President Ortega in May agreed to negotiate, as he started holding peace talks with protest and opposition groups such as the Civil Alliance Opposition, and the church, in a move to make Nicaragua a more democratic country. One of the main points discussed was the possibility to hold free and open elections in March of 2019, but this does not mean that the current president will lose his post. Ortega has not yet made a definitive arrangement to show his backing of this proposal, even though he has mentioned that he is willing to allow for the separation of different governmental powers such as the courts. However, he is also being accused of stalling the talks, as the ongoing violence that erupts in major cities across the country, involving government men as well, have been putting off the talks since late June. Ortega is also under attack from human rights organizations, as he is refusing to release a clear death toll, or take responsibility, despite pressure from the IACHR, part of the OAS.